Small Kitchen College » College Town Tours: The Best of Washington, D.C.
College Town Tours: The Best of Washington, D.C.
As the capital of our nation, Washington, DC is home to some of the most historic sites in the country and the center of the political scene. However, with 10 universities based here and a multitude of programs hosted by colleges and universities from around the country, DC is very much a college town. So what happens when you put all these factors together? According to a survey highlighted by the Huffington Post, DC also ranks as the eighth most expensive city to live in. Naturally. But in the midst of the high-priced hustle-and-bustle of the city, there are plenty of places for the college student to get their fix of good food, culture and, of course, fun that won’t break the bank. 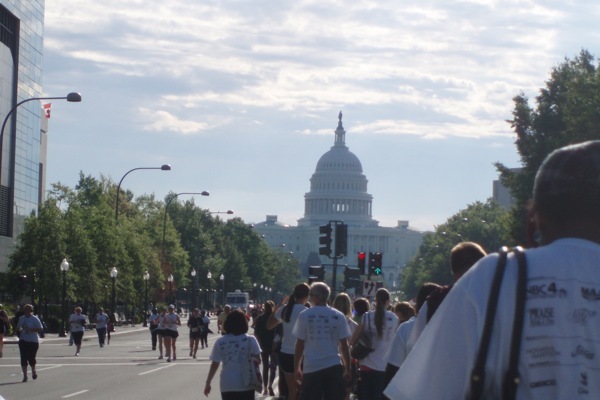 This list is only a smattering of what the District has to offer, but it will provide a starting point for DC students to get out and discover the nation’s capital. Frozen yogurt is fast becoming the hip new thing across the country, and DC is no exception. There are many frozen yogurt bars in the city, but one definitely stands out as the best. Located in Friendship Heights, FroYo is self-serve with a variety of flavors ranging from Original Tart to seasonal flavors such as pumpkin pie, peppermint stick, eggnog, and coconut. Top your yogurt with any kind of toppings from fresh fruit to Captain Crunch cereal. Priced by the ounce, a heaping cup of frozen yogurt is very reasonable, even for a college student. Located on busy Wisconsin Avenue, Max’s Best Ice Cream is a small homemade ice-cream parlor run by Max himself. The flavors frequently change, and include a variety of both traditional and creative selections. It’s always nice to be able to have a Mom and Pop type place to go, especially if you’re ever feeling homesick. And let’s face it; is there anything ice cream can’t fix? This farmers’ market is definitely the best in DC! Held year-round, the market is conveniently set up right outside the Dupont Circle metro stop, making it super accessible. Goods for sale range from an abundance of fresh, local produce, dairy products, meat, fish and baked goods to flowers and handmade organic soaps. The participating vendors differ depending on the season. I’d recommend walking through the entire market once before buying anything to compare what’s available. But be sure to tough out the long line in front of Bonaparte Breads to try a Chocolate Almond Croissant; they’re enormous and somewhat pricey, but definitely an experience not to be missed! A popular spot to browse through books and have a bite to eat, Kramer’s doubles as a bookstore and a café. Kramer’s is open seven days a week and has a complete menu for breakfast, lunch, dinner and Saturday and Sunday brunch. If you’re not up for having a full meal, Kramer’s is famous for their desserts, so after perusing the book selection enjoy your book over some pie or cake! Busboys and Poets is really an amazing place to go. There are two locations in DC, one in Chinatown and one on 14th Street, both of which exude an artsy, multicultural atmosphere. There is a bookstore connected to the restaurant, and there are weekly Open Mic poetry readings as well as guest speakers and performers. Not only is Busboys and Poets the optimal place to immerse yourself in culture, the arts, and literature (the name Busboys and Poets is actually inspired by Langston Hughes), but the food will satisfy both your palate and your budget. Founding Farmers is hands-down my favorite restaurant in DC. Everything on the menu is made using local and seasonal ingredients, and the dishes are both unique and traditional. Founding Farmers is open for breakfast, lunch, dinner, and weekend brunch, and the prices are incredibly reasonable, even for the college student’s budget! If you are going for brunch, I would recommend calling to make a reservation as the restaurant has become very popular. Although one of the biggest tourist attractions in DC (yep, it’s right up there with all of the monuments! ), the cupcakes at Georgetown Cupcake are not to be missed! Sporting a menu of 5 daily flavors and multiple seasonal flavors in addition to 16 permanent flavors, Georgetown Cupcake is located at the end of busy M Street in Georgetown and can be easily spotted by the line that snakes around the block. But don’t be intimidated; the cupcake waiting at the end is definitely worth the wait! New to DC, the Capital Bike Share made its debut as the latest mode of transportation in the spring of 2010. There are over 110 stations located across the District and Arlington, Virginia where you can rent a bike. The bikes can be returned at any of the stations in the city. The program allows an unlimited amount of trips, and you can acquire membership for $5 a day, $15 dollars for 5 days or $75 dollars for a year, depending on how often you might use it. In an era where fast food (unfortunately) reigns, Sweet Green is a refreshing new twist on food-on-the-go, Earth-friendly style. You can choose from a menu of salads and wraps that are Sweet Green creations, or create your own. Everything is made to go with local and organic ingredients and packaged in compostable containers. If you’re not in too much of a hurry, grab some of Sweet Green’s frozen yogurt for a sweet finish to a healthy meal. The name may seem odd, but you’ll find the best falafel in DC at Amsterdam Falafel. The restaurant is a hole-in-the-wall shop marked by a big sign advertising “Falafel and Fries” on the outside and decorated with quirky art and Dutch hookah and marijuana bar menus on the inside. Strange? Maybe. But the falafel is absolutely delicious. Add as many toppings as you want (all free!) and enjoy your falafel while checking out the décor. College students hardly ever pass up anything free. The National Symphony Orchestra’s annual Labor Day concert held on the West Lawn of the Capitol Building should be no exception. Set up a blanket with friends and a picnic dinner and enjoy the fantastic music of a professional orchestra and view of a lit up Capitol Building. Spring is my favorite season: I love how everything starts to turn green and flower as the weather gradually turns warmer. Unfortunately, DC doesn’t have much of a spring. One minute it’s winter, and then the next thing you know it’s a whopping 85 degrees and humid. Nice. While it doesn’t last long in DC, however, the three weeks when the cherry blossom trees bloom around the Tidal Basin and monuments scream spring. The blooming of thousands of cherry blossoms with the Tidal Basin as a backdrop is really a beautiful sight to see—and it’s free! Now I may be a huge environmentalist, but the Green Festival that occurs in cities across the country is a convention that everyone will enjoy. The Green Festival is held in DC every fall in the Convention Center, and a host of sustainable vendors promoting food, clothing, crafts and just plain awareness set up their booths for three days. Whether or not you’re into the environment, it’s definitely worth checking out the festivities (there are free samples including chocolate, Cliff Bars, and Honest Tea) while enjoying music and speakers as well. When you think “community service” the first things that typically come to mind are soup kitchens, helping the poor, maybe participating in a community clean-up. How about planting trees? Casey Trees is a non-profit organization that works to reforest the city of Washington, DC. They plant trees in various neighborhoods around the city, and it’s a great way to get involved and meet the people living in the communities around campus. While planting may require waking up early on a long-awaited weekend, you will get free coffee and breakfast, and occasionally lunch in return for your service. The Dav, as it’s called by American University students, is by far a favorite destination on AU’s campus. It’s a great spot to grab a coffee or tea at any time of the day – the Chai tea is a must try. There are a variety of snack foods as well, including pastries and vegan cookies, which are very yummy. As a Jewish New Yorker, one of the classic foods I grew up with was – you guessed it – the bagel. I often get a craving for a good bagel (especially around Yom Kippur), and when I do, I go to Einstein’s. With five locations around the city and one right on American University’s campus, the bagels at Einstein’s not only stand up to New York style standards but are easily accessible as well. There is always a wide variety of bagels – I like the pumpkin bagel featured in the fall – and a good selection of “shmears” to boot. Einstein’s makes sandwiches as well, including my favorite Nova Lox Bagel, all of which make a hardy meal for a surprisingly reasonable price. Who would have thought that it was possible to create an entire museum full of top-secret spy paraphernalia? I mean, that sort of stuff is called “top-secret” for a reason, right? Not so at the Spy Museum. Here you get the unique chance to take a shot at being a spy yourself. As you move through the museum, there are prompts and scenarios for you to test your spy skills. Of course, as it is a museum, original spy technology from around the world is displayed. If you thought the awesome gadgets used in spy movies were just a product of Hollywood, take a trip to the Spy Museum to see how they’ve been used in real life. This museum does have a $20 fee (Parent’s Weekend activity?) but you definitely get the bang for your buck. Sarah McAnaw is a junior at American University where she’s working towards getting a degree in International Studies and cooking for friends. She is studying in Florence, Italy this fall and is looking forward to immersing herself in art, culture and, of course, authentic Italian cooking. I totally agree with all your choices, especially the Dav! Like all your recommendations above. Since there are tons of Mobile Food Trucks in DC now days, how about a best Mobile Food Truck? Just wanted to let people know that FroZenYo (the place mentioned at top) has multiple locations around the city. At least 2 downtown and one by the National Zoo and in Columbia Heights. Another question, for the best bakery did you try Paul? to start my own blog in the near future but I’m having a tough time choosing between BlogEngine/Wordpress/B2evolution and Drupal. The reason I ask is because your design seems different then most blogs and I’m looking for something completely unique. I mean, I don’t want to tell you how to run your blog, but suppose you added something to maybe get people’s attention? I mean Small Kitchen College � College Town Tours: The Best of Washington, D.
I’d never understand. It seems too complicated and extremely wide for me. I’m taking a look ahead for your next submit, I’ll attempt to get the hold of it!